Brasilian favelas (Brasilian slums) are often treat with a degree of fear, disdain and even at times intrigue. I spent two months volunteering at the children's charity Project Favela located deep within the heart of Brasil's largest and most infamous favela, Rio de Janeiro's Rocinha. My time living and working in Rocinha was to prove to be one of the most rewarding, most challenging and unfortunately one of the most dangerous experiences of my life as I was to experience both the beautiful and dark sides of life in Brasil. This is my story. This is Rocinha. Over two years ago, during my first visit to Rio de Janerio I instantly fell in love with this amazing city. I was extremely reluctant to leave as Rio had made a lasting impression on me but I vowed to return. While I had an amazing time during my first visit to Rio (you can read about it here) I clearly understood that visiting Rio and actually living in Rio can be two entirely different propositions altogether. When visiting Rio as a tourist you can almost be forgiven for believing that life in this postcard city is near perfect and quite frankly who could blame you? Boasting beautiful beaches, world class views, extremely friendly locals (Cariocas), a uniquely vibrant culture and an amazing night life..... what is not to love about Rio? However, once you peel back the layers and invest more time in Rio you will quickly learn that life is not as perfect as it seems. In fact life can be extremely challenging for the majority of the cities population. Less than five minutes walk from Rocinha is some of the most expensive real estate in Rio. Welcome to the Labyrinth that is Rocinha. Unlikely Motivation: "They are from the favela, know your place!" I often recall a conversation I had on the famed sands of Copacabana beach during my first visit to the city. While watching a group of skilled locals playing a friendly game of beach football I eagerly questioned my local friend on how to say "can I play in Portuguese?". Her response was to shock me. "No, no you cannot play! They are from the favela, know your place!" she sternly responded. I count myself blessed to have spent much of my life living in New Zealand and Australia where class divides are not so evident. In both countries I found most people will usually form friendships based on how well they get on rather than their social status. My friend is not a bad person, far from it but unfortunately this is a clear illustration of the very strong stigma commonly associated with the lower classes in Rio. Two years later with this comment still sitting in the back of my mind I was to return to Brasil, to Rio de Janeiro and to Rocinha the biggest and most notorious favela in the Latin Americas. Rocinha was to become my new home. During my original trip to Rio I stumbled across a very small grass roots charity called Project Favela. Through this charity volunteers from around the world would come to Rocinha to teach the local children in a bid to make a real difference in their young lives, no matter how small. During this encounter I remember thinking that while I may not be able to change the world but if I can change one life then my efforts would be more than worthwhile. I knew then and there that I had to return to Rio to contribute towards this amazing little charity! Just under two years later when talking to Project Favela founder Scott Miles I did not take much convincing to return to Brasil and to make Project Favela and Rocinha my new home for the next two months. 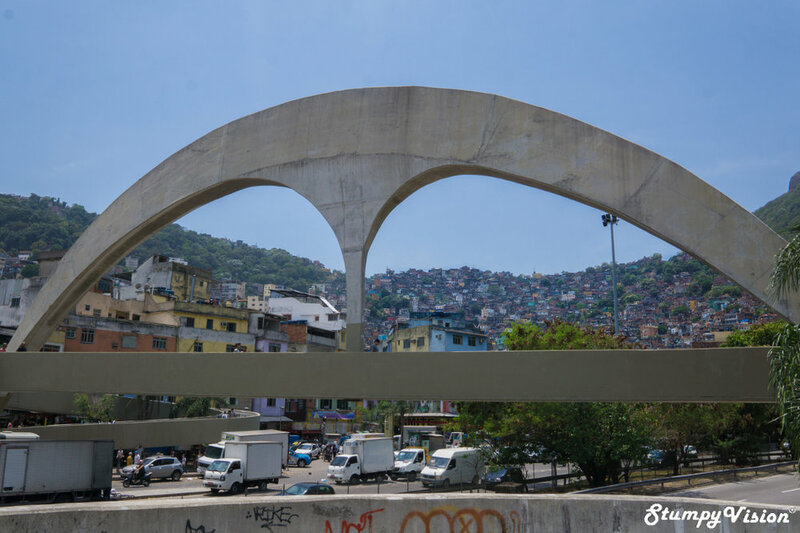 The iconic walkway and entrance to Rocinha. In August of 2017 I found myself standing nervously alone at the entrance to Rocinha. This giant slum sits in the valley between the Dos Irmaos (the Two Brothers) and the Gavea mountain ranges. 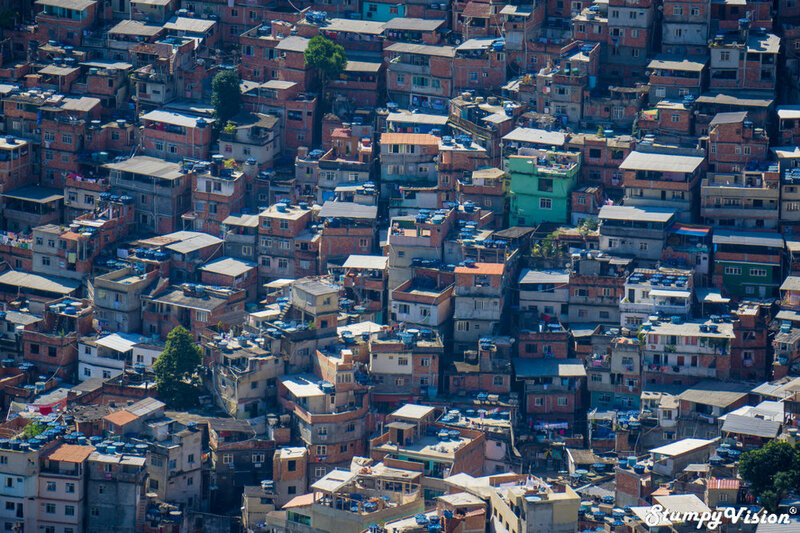 While Rocinha officially houses 60,000 people many believe that this figure is actually nearer to 200,000 people. It was a truly intimidating arrival. I was instantly swallowed and overwhelmed by the insatiable chaos of Rocinha as the locals flooded the busy streets negotiating the skilled moto-taxis and aggressive taxi drivers that sped through the narrow, disorganised and dirty streets of the favela. It was a huge shock to the system and a complete overpowering assault on the senses. The reality of what I had got myself into had well and truly set in. I was thrown in the deep end and it was time to either drown or swim. Soon these strange unfamiliar sights and sounds were to become normal as this perfectly imperfect favela became my new home in Brasil. On my arrival I found myself with very little time to acclimatise or rest on my laurels as the very next day was to be my first day of teaching at Project Favela. Possessing absolutely no teaching experience whatsoever and next to no grasp of the Portuguese language, on paper teaching here was a very daunting prospect. Regardless Project Favela was something I strongly believed in and was incredibly excited about.... it was precisely what had drawn me back to Brasil. There was absolutely no turning back now. Project Favela founder Scott Miles in action. Project Favela was originally founded in 2009 by American Expat Scott Miles when he chose to follow his dream of establishing a school in the favela to educate local underprivileged children. 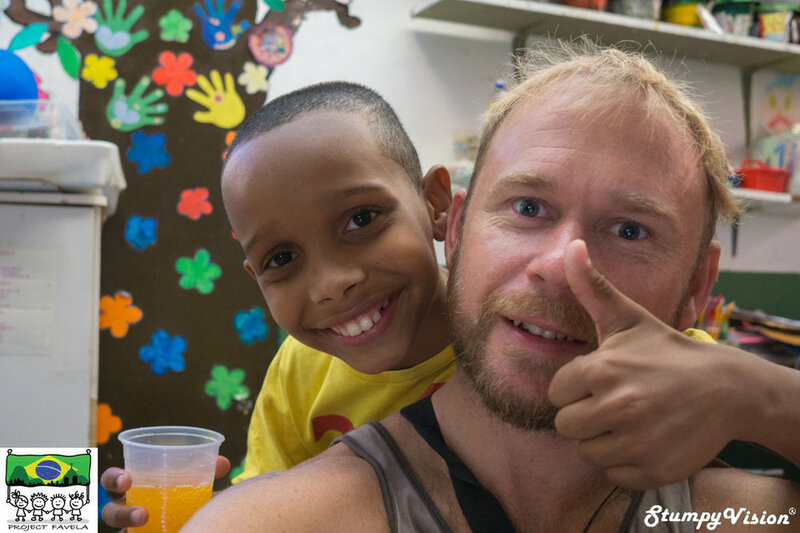 Scott's main goal was to give the children a stepping stone in order to help them overcome some of the many challenges faced when living in Rocinha. 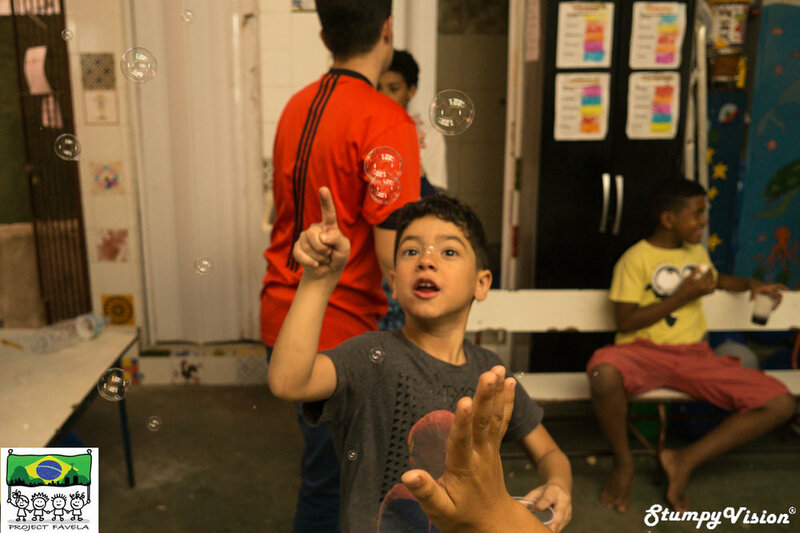 Project Favela provides a free after school education program teaching the local children English, Mathematics, Science, Art, Drama and Music as well as providing English classes in the evenings for adults. The program is completely voluntary for the children in the sense that they do not have to be there. Yet the children flock to Project Favela in their droves! Their immense love for this fun, caring and loving learning environment is obvious. Ever heard of children in your home country volunteering for an additional four hours of education after already completing a full day of school? No I didn't think so. 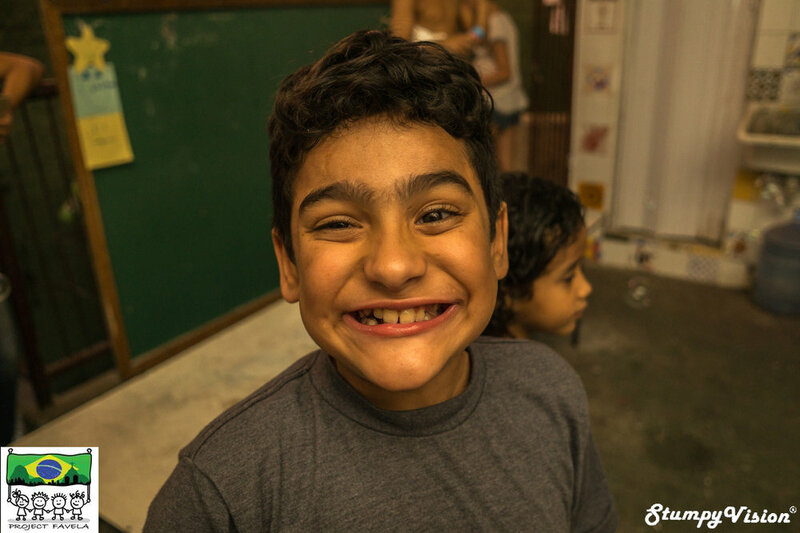 At Project Favela the children are often seen excitedly banging on the doors of the school close to an hour before classes are due to commence, Project Favela is clearly doing something right here. 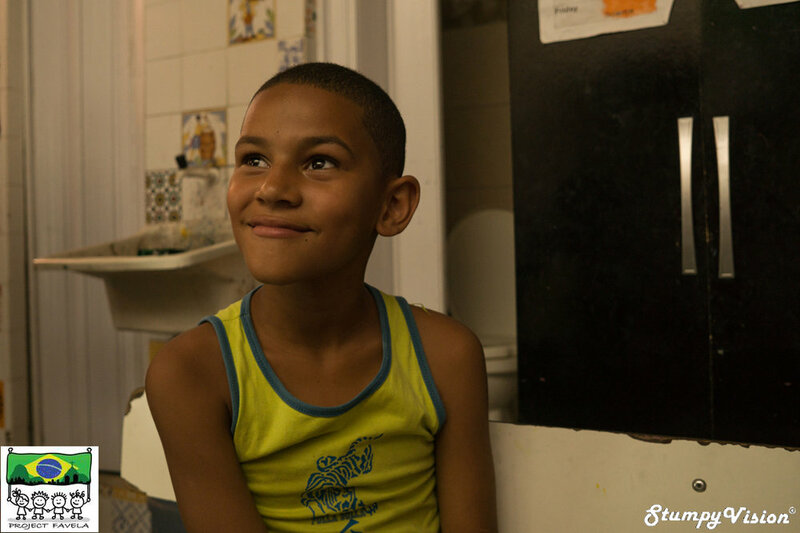 In Project Favela the children have a positive learning environment as well as a safe place where they can temporarily escape the challenges and even the dangers associated with the favela life. The favela can be an extremely harsh environment for the children growing up here. Rocinha is vastly overcrowded with many families and children living in extreme poverty. Mention malnutrition, terrible sanitation, poor hygiene, bad health and l little to no levels of education and you are just scratching the surface on the problems that exist here. To further complicate an already complicated situation the biggest economy within the favela is the drug trade with Rocinha being responsible for the supply of approximately 60% of all cocaine consumed in Rio. It is common place to witness dealers dealing openly in the streets with their hand guns and AK47 assault rifles proudly displayed in plain sight in the very streets that the children play. This is the reality of life in a favela. Smiles, personalities and hearts larger than life! Welcome to Project Favela! The Children, Smiles for Days. 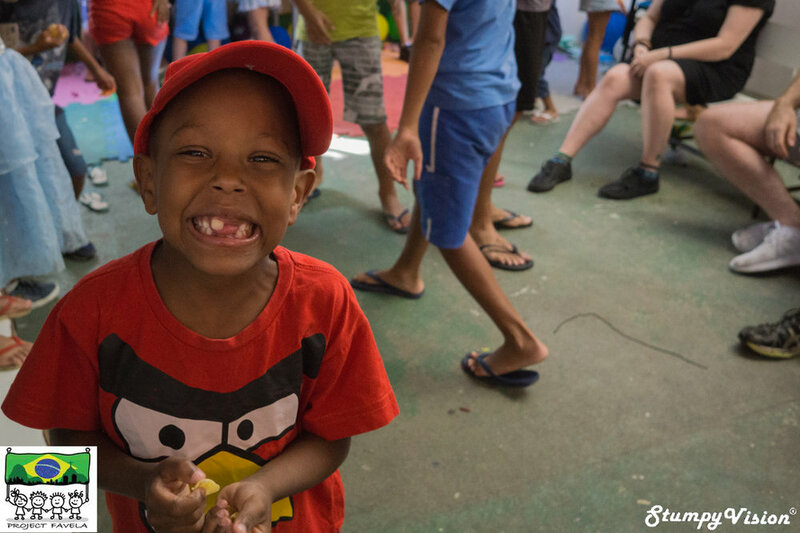 Despite the extreme challenges faced by the children Project Favela is the second home to some of the kindest, funniest, most caring, highly intelligent, resilient and happy children that you will ever have the pleasure to meet. No matter what I say here words simply are not suffice in describing how truly amazing these children are. 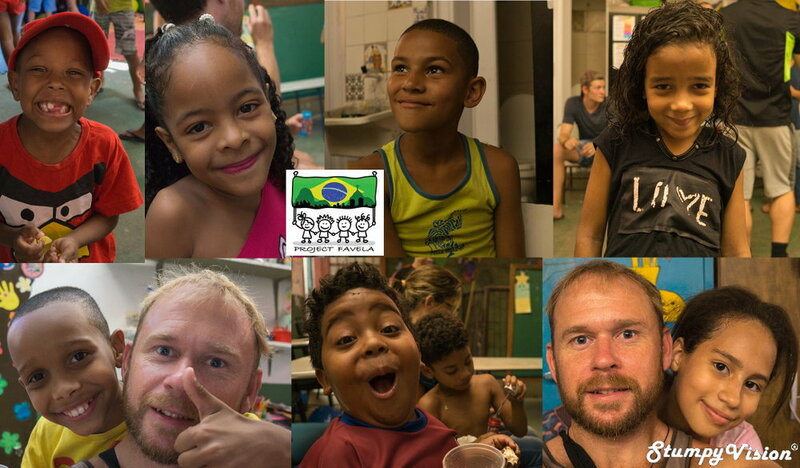 Within days of teaching at Project Favela you will soon find yourself falling in love with these big hearted children. Their love for life and bottomless energy is truly infectious. These children are amazingly unique and possess vibrant larger than life personalities. Some say my teaching techniques were unorthadox but I prefer the term revolutionary. Welcome to Project Favela, photo by Franziska Kleinhempl. New project Coordinator Lily Harrington from the USA. Fede Baez from Spain and from Sofie Skovrup from Denmark. Mama bear, Nazarene Jones from England. Praia de São Conrado, 10 mintues walk from Rocinha, is the Favela life really that bad? Damning Stigmas or Just Reality? Sadly many Brasilians I encountered where actually shocked to learn that international volunteers would choose to volunteer and work in a favela. Brasil in fact has a massive stigma when it comes to favelas. Many Brasilians do not even like to associate with people from favelas. Favelas are viewed as being dirty, dangerous and unruly places best avoided and although their is some truth in this it is not always the case. Despite the negative stigmas and perceptions surrounding Rocinha during my first month living there not at anytime did I feel remotely in danger. Many favelas have an unwritten law or code/conduct in that it is forbidden to steal, hurt or kill in the favela and doing so would incur the wraith of head of the favela (the leader of the gang that controls the favela) in ways I do not want to mention... but I am sure you get the picture. During my first month in Rocinha I could openly walk the streets alone, even at night. I had no safety issues whatsoever and I would even use my mobile phone openly in the streets of Rocinha which is something I would rarely do in most large cities in Latina America. Some go as far to say that streets of Rocinha are actually much safer than Central and downtown Rio and even Copacabana at night time. If the truth be told not at any time was I harassed or remotely threatened during my first months stay. While the people of Rocinha were no way near as friendly as I had originally anticipated they were by no means unfriendly. From my personal experience I found most people treat me with a quiet indifference or a reluctant tolerance. However, one Sunday morning in mid September this sense of safety and security was to be violently shattered. At 5am that morning Rocinha erupted into bloody violence. The two gangs, "Amigos dos Amigos" (ADA, lead by an imprisoned Nem) and Rogério 157 (a splintered faction of ADA led by Rogério Avelino da Silva) who had previously held an alliance for control of the favela broke their truce and broke out into open and violent warfare in the streets of Rocinha. For four hours straight on this fateful Sunday morning thugs armed with all manner of assault rifles stormed the streets of Rocinha battling for control of the favela. Gunshots rung out as bullets filled the streets until finally one gang was eventually forced to tuck tail and flee. The official death count was given at four people yet locals believed that this number was definitely in the double digits. 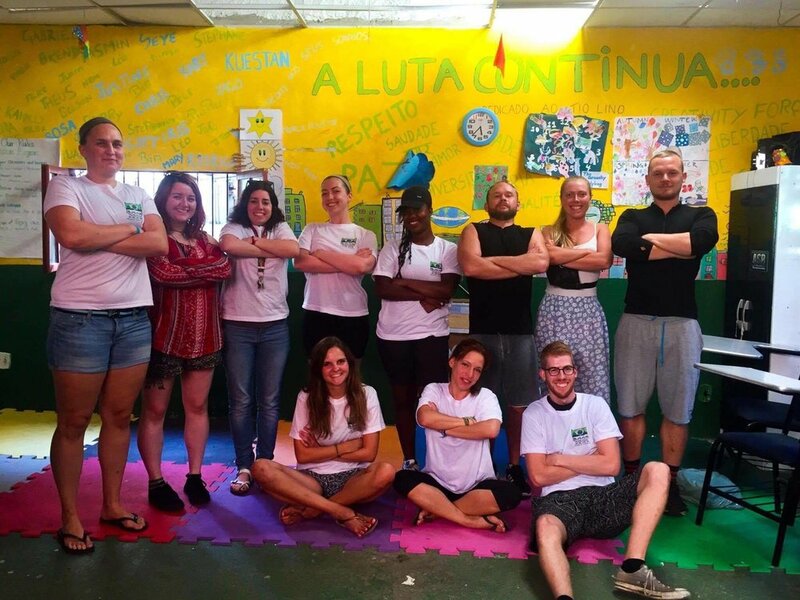 The organisers of Project Favela were now left with a massive dilema on whether to close the school for the safety of the volunteers or to keep it open for the children. They made the gutsy call to keep the school open on calm days with the aim of keeping the children off the now dangerous streets. Bravely the majority of volunteers kept with the project over this period in order to keep the charity operating. They were determined not to let the cartel activity destroy the positive impacts of the project. The violence continued throughout the next week but on a more sporadic basis. It was all come to a head on the following Friday when Police forces were heavily fired apon when attempting to enter the favela. This particular outbreak actually took place less than one street away from where I was exercising at a local gym. It was truly surreal to hear live gunshots less than a street away while watching the situation unfold live of TV. Throughout my life I have witnessed many dramatic events unfold on the television screen but to be caught up in one while watching it on live television is an entirely different kettle of fish altogether. Looking back now I am somewhat surprised with how calm and collect I was with the situation. I had been considering leaving the project due to the safety issues and I promised myself that if the situation was to worsen I would definitely leave. By this stage the local authorities had finally had enough. The dramatic call was made to mobilise the armed forces. That night 950 soldiers accompanied by army tanks and elite swat units (BOPE) entered the favela in search of the drug dealers. Rocinha was on lock down. I could not believe what I witnessed when literally hundreds of soldiers advanced up the streets of Rocinha that evening. An uneasy peace descended apon Rocinha and it remained that way for a week. Photo by Carl De Souza. It all comes to a head for Rogério Avelino da Silva. Believe it or not but this was the first serious spate of violence in Rocinha in almost eight years. Prior to these events there had been relative peace. I have recently received great news that the situation has somewhat stabilised in recent weeks as Rogério Avelino da Silva (the leader of Rogério 157) who originally instigated the gang war has recently been apprehended by Police and taken into custody. I greatly hope that this arrest signals the end of the extreme violence in Rocinha for the sake of the residents, for the sake of the brave volunteers that continue to work there and for the sake of the amazing, amazing children living there. Working in Project Favela was one of the most rewarding and at the same time dramatic experiences of my life. I dream of a day where the children can attend Project Favela without fear for outbreaks of more violence, more bullets and more blood. They deserve so more than this. In closing I would like to share the sadness and reality of the situation through the words of one of my students Moises. Seeing the world through his eyes further illustrates the deep sadness of the situation. Moises, a shinning light. Photo by Anna Balch. "I was at home when the operation began. I woke up startled, but that was all. I think the other people felt scared, but I didn't. This is normal for me, because there's always shooting here. I see guns all the time. I always walk in the street and I see the gang members selling drugs. They do not hide, they are always out in the open. I see everything when I go out to buy food for my family. It's very scary. My mom says we should not use drugs because it's bad, every hour a person dies because of it. I really want to move out of here one day. I would like to live in a quiet place, without shootings. I would love to go to other countries. I would like to visit China, New Zealand and the United States. I'm part of Project Favela here in Rocinha and I have the opportunity to learn a lot of things there. I don't have a lot of free time because I am always there. I do Capoeira, we also play tennis, and there are English, Spanish and Math classes too. It's a great opportunity because it's free. With all these opportunities, we have the opportunity to get our minds off the bad things happening here. I want to be a scientist when I grow up. I love building and doing experiments." 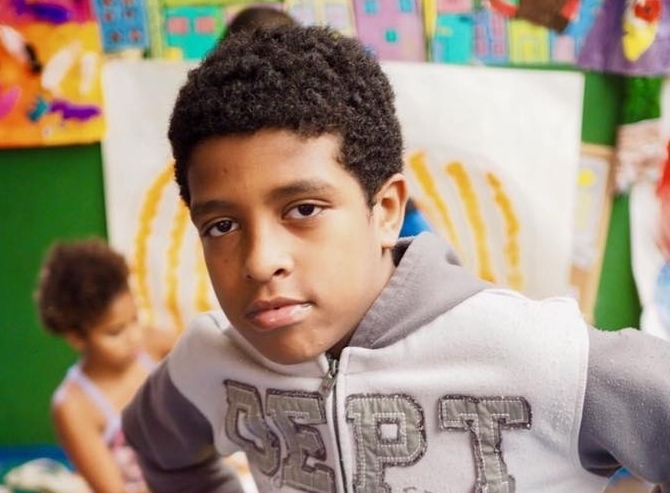 If you would like to make a difference please support the amazing work of Project Favela by volunteering or donating on the following website http://www.projectfavela.org/ . It was an absolute pleasure working with these unbelievable children and I would recommend it to anyone in a heartbeat. I strongly believe that it is of great importance to give back to the communities and countries that you visit in whatever way possible. So please if you are fortunate enough to be blessed with the time and resources to be able to volunteer or contribute towards a local charity please grasp it tightly with both hands. You will experience one of the biggest life changing moments of your life. You will take away with you far more than you could ever give especially in regards to experiences, memories, skills and deep sense of fulfillment. Thank you for your time and thank you for reading.